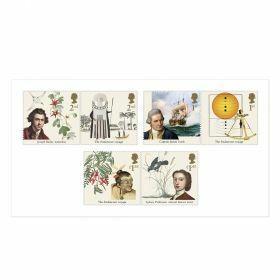 The ideal collectible, the Miniature Sheet Includes four Special Stamps from this historic issue. 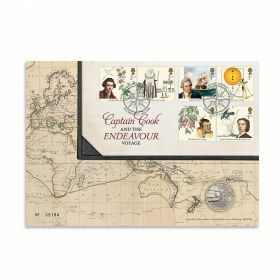 The background image shows hand coloured engravings from SeasA Journal of a Voyage to the South Seas, 1794. 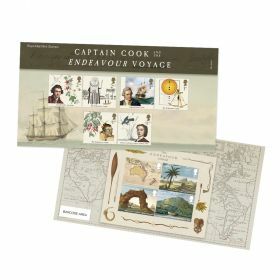 The Miniature Sheet includes: First Class – a chart exhibiting the discoveries made by Captain James Cook by Lieutenant Roberts. First Class – boathouse and canoes on Raiatea, Society Islands. £1.45 – an arched rock with a Maori clifftop fort in New Zealand. 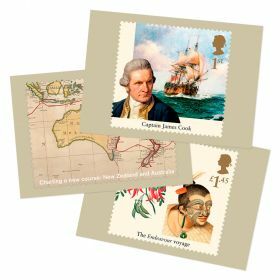 £1.45 – repairing The Endeavour on the Endeavour River, Australia.